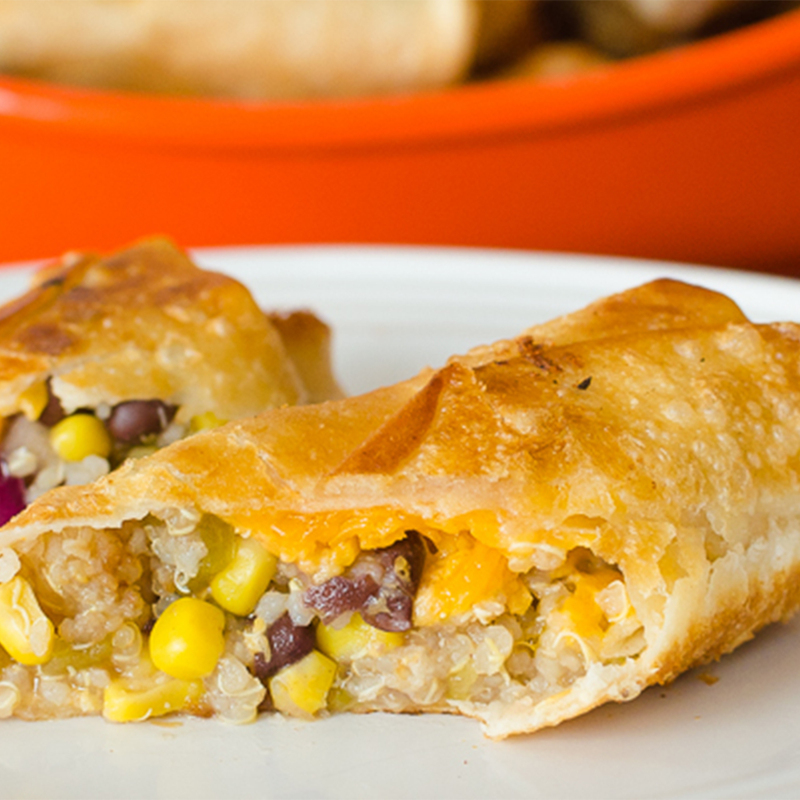 This southwestern quinoa chimichanga recipe is made with quinoa. It makes quite a bit (12-16 chimichangas), so feel free to adjust the recipe it if your family isn’t as big as mine, but if you’re going to the trouble of frying, why not just make them all and freeze the leftovers for another night…you know…when you’re tempted to pick up the phone and order take-out. It’s just like buying a box of frozen chimichangas, only they’re healthier and less expensive. Alternatively, invite the neighbors over for dinner, if you’re a social type of creature. I have a stock of them in a zip baggy in the freezer (neighbors weren’t invited); lazy & introverted. Made with quinoa, black beans, and corn. Leftovers freeze well for use on busy nights. Try topping it with fresh salsa or cheese sauce and serve with tortilla chips. In a large bowl, combine the: diced tomatoes, cooked quinoa, black beans, fiesta corn, green chiles, diced red onions, and lime juice. Mix until combined thoroughly. In a deep fryer or large cast iron skillet, add vegetable oil as per manufacturer instructions or until the oil reaches 1-1.5 inches high in the skillet. Preheat the oil on medium/low heat. Place an uncooked flour tortilla on a flat surface. Using a tablespoon, scoop two tablespoons of the quinoa mixture and place it onto the tortilla. Sprinkle the shredded cheese on top, if desired. Tuck in the ends of the tortilla and roll it. Place the uncooked chimichanga into the preheated oil in the skillet or fryer. Fry the chimichanga for 2-4 minutes total, turning once to ensure both sides reach a golden brown appearance. Remove the fried chimichanga from the oil and place on a cooling rack with a paper towel underneath to catch any dripping oil.